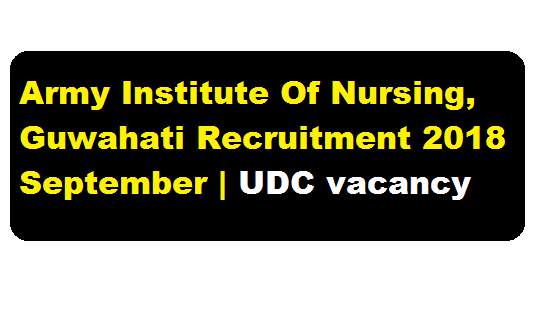 Army Institute Of Nursing, Guwahati Recruitment 2018 September | Upper Division Clerk Post :- Army Institute Of Nursing, Guwahati has published its recruitment notification in the month of September 2018. According to the Army Institute of Nursing Ghy vacancy notification 2018, Army Institute of Nursing, Basistha, Guwahati invites applications from suitable candidates for filling up the post of Upper Division Clerk Post. In this section, we will discuss in details about the recruitment of Upper Division Clerk Post under Army Institute Of Nursing, Guwahati Recruitment 2018 September with vacancy details, eligibility criteria, salary with other details and requirement. Educational Qualification: Candidates must be Minimum graduate in case of Civilian candidate. with high proficiency in staff duties and drafting experience can apply. (ii) Should be medically fit and age below 53 years. (iii) Computer proficiency – MS Office, Excel, Power point etc. (iv) Should not have any disciplinary case against in entire service. Application with connected documents duty completed along with two passport size photographs be send to Army Institute of Nursing, C/O 151 Base Hospital, Basistha, Guwahati, PIN-781029 by 01 Oct 2018. applications will only be received in sealed envelope by post.